"Girls camp," I thought to myself at first, "that could be super lame." What immediately came to mind were a few goofy LDS genre films that were out there, and I shuddered at the thought. However, my friend Lisa Valentine Clark and I HAD been looking for a creative project to do together. She had recently finished up her award winning web series, Pretty Darn Funny, and I had recently survived living in Manhattan for three years with four kids with all my wits intact (mostly.) Plus, if a girls camp movie was going to be made by someone, it should probably be us. Mainly because I didn’t want someone to make a stupid movie on the subject, mocking or belittling the institution, especially since it is such an important spiritual rite of passage for so many LDS teens. "OK. Ready to write the Girls camp movie now?" With that, we set to work creating the story and screenplay for our girls camp movie. Through a series of phone calls and Google Hangouts (he’s based in LA and I’m in Denver), we determined that our lead girl would be Lane Speer, a non LDS 16 year old girl struggling with the recent loss of her father. She soon meets 12 year old Phoebe Valentine, riddled with anxiety, but incredibly intelligent. We put ourselves in the shoes of YW leaders Carrie Carrington and Holly Valentine, and planned out every day and activity of our girls camp. We drew from a long list of real life camp experiences, brainstormed by ourselves, our friends, and loved ones. Lisa helped when she could, although she was occupied writing her own book at the time. We wanted to make sure that the leaders, who would be played by Lisa and myself, were very true to us in real life. We based all of the teens in the movie on actual girls we knew and loved. We wanted the screenplay to be truthful so that our audience would identify with these characters as people they cared about, and not just flat stereotypes. By the time the last few pages of the screenplay were written at the end of July 2014, we knew we had a special story on our hands. We held a reading of the script in Utah, with trusted friends and family members present. I’ll never forget what it was like to be at that read-through, hearing those characters come to life for the first time. We laughed and cried and at the end of the evening, I felt so proud to be a part of this project that was bigger than all of us, and I was so grateful to Maclain for persuading me to work on it, even when I didn’t share his initial vision. When the movie is released this August (watch the trailer), two years will have passed since our first conversation. Today, I can say that I stand 100% behind this movie. Not only does it have themes of acceptance and unconditional love, but I feel like it’s an important film because it has so many positive role models for girls. Young women these days need to know that they are loved, and they need to know that they MATTER. On this project, the jobs performed by women include producing, editing, story, production design, art direction, costume design, hair and makeup, and of course, all of the talented ladies who make up our cast. This movie is about women coming to the rescue of women, in an honest, heartfelt, often humorous way. However, it’s not only for teen girls and their moms. We have screened a rough cut of the movie to men and women of all ages-I’ve heard of a thirty year old guy in tears and I’ve listened to a sixty year old man bust a gut laughing. My eight year old twins are huge fans. It’s definitely a story that the whole family will enjoy. Not only that, but because the story portrays the unique perspective of an LDS girls camp from a non member’s point of view, you will be able to share it with all of your friends, regardless of religious beliefs. Over the past few weeks, we have been thrilled by the amount of views that the trailer has received: over 300,000 on Facebook. This is an indicator to us that potential audiences are excited about the movie, and that there will be a demand for showings outside of Utah and the “Book of Mormon belt.” However, as is always the case with an independent film, we will need your help. If you would like to get the movie to your area, you can do a few things. 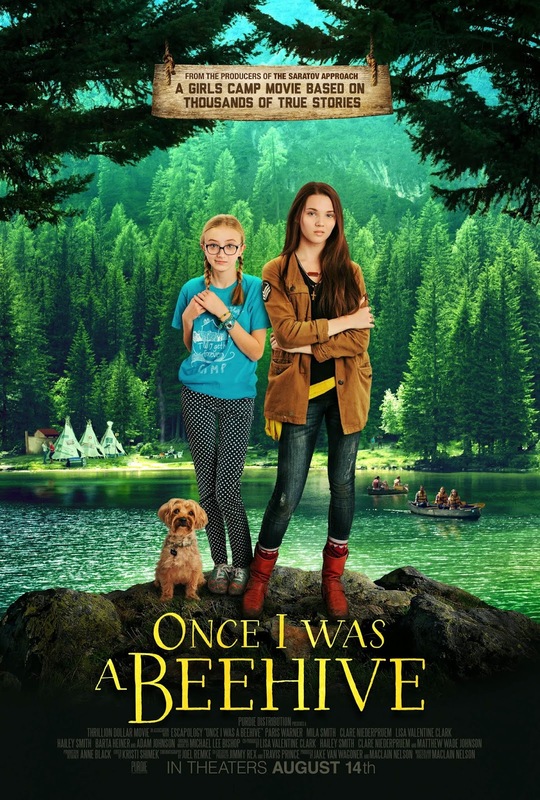 First of all, “like” the Once I Was a Beehive page on Facebook and share the trailer with your friends on social media. Then, please email us at girlscampmovie@gmail.com if you would like to be a “Busy Bee” and help bring the film to your area and all over the country! The bottom line is that, if audiences want to see more quality LDS films and especially, more FEMALE driven quality films, then they can do their part to help. We are so excited to share this movie with the world, and hope you’ll join us for the journey.